@ Granny, no worries, moyt, didn't come off like anything but a good suggestion. Cheers! Actually, a pair of industrial sized bolt cutters would make me feel safer. Hard to hide in the book bag though. A hammer would fit. Thanks guys! roadwalker,I hope that you and the other folks in similar circumstances will really try to solve those escape route problems. I would never forgive myself for not pushing harder if something happened to any of you as a result of something you could have fixed. Duplicate keys? The building 'caretakers' have probably lost them; and even if they still did have the keys, the chance of them giving (or allowing me to duplicate) a set is probably on par with going a week without a power or water failure. Perhaps you are on to something. Cut off the old locks and replace them and keep the keys. I wonder how long it would be before anyone, in authority, noticed and changed the locks? There was a very bad fire here in Fortitude Valley in Brisbane a couple of days ago. Fortunately the buildings were only about five stories high. A young man and two young ladies were trapped on a balcony with seconds to spare. The bloke said that his only choice was to JUMP off the balcony into some bushes below as he knew that the fire would get him if he did not. I thought of you cruisemonkey when I saw him on TV; I thought that at least you would now be able to throw out your rope and climb down. Fortunately he had dialled emergency services earlier and they directed a "Cherry Picker" to the balcony. Would you believe that this piece of equipment BROKE just after rescuing these people and there was not another suitable one around if it had been needed. I can tell you that a lot of questions are NOW being asked as they realize that they need MUCH more in the way of how high they can reach. They only just reached these people. Does anyone on China make rope ladders which could be purchased by someone who would not be as agile as cruisemonkey? 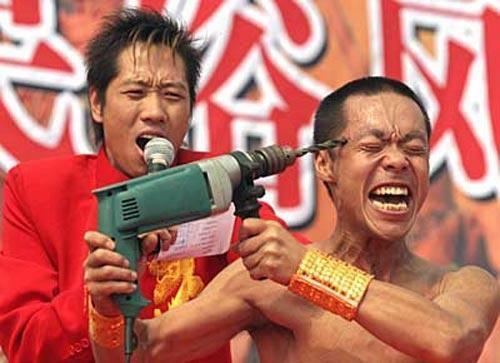 The Chinese are incompetent/negligent/dumber than a bag of hammers - but that's their problem. Be that as it may, I'd hate to have it on my concience that 2000 students and 40 instructors died because I changed the locks. I'll get out of the damn building... and without having to face trial and execution when convicted in a Chinese court of negligent manslaughter. No, not seriously cruisemonkey. Just trying to generate some ideas on ways to solve that problem. Who knows where the keys are if the "in charge" person is away? Does one key fit all? etc etc. After the event, people often can't believe that they didn't think about certain obvious aspects. In relation to the fire in Fortitude Valley, they had to admit that they did not have a "turntable ladder" capable of enabling mass rescue of residents in medium to high rise buildings. To be in any high-rise building on a floor above the highest the ladders can reach, is to be in a potential death trap. Now, add to above: negligence, bribery/corruption and a lack of 'common sense'. You are right cruisemonkey. I would hate to live in some of those really tall buildings. One thing which really upsets me is the fact that there is a lot of avoidable death if people just used their common sense or did some planning. A discussion like this often prompts people to stop and think. If they would just try to imagine waking in a smoke filled room and then imagine the actions that could be taken in the event of different areas being blocked off. Can they get out the bedroom door? Is the window the only escape route? Can they climb up or down if they have to? In the "Valley" fires, a suitable "Turntable Ladder" existed, but the Fire Brigade only had hydraulic ladder platforms. In an area like this, it is an example of really poor planning by people who should know better and I understand that there will be action being taken. I spent 20 years 'at sea' with the Canadian Coast Guard before retiring and becoming landlocked in China. We trained constantly to prevent/fight fires at sea on: ships, fixed-wing aircraft, helocopters and hovercraft. I have pulled more than one, 'well-done' dead sailor from the ocean's icy grip. It is not a nice feeling to have someone's arm/leg 'come off' in your hands. Please think about how you would get out of your apartment given a worst case scenario. C'mon, it will never happen to me. I am quite fortunate to be living not too high up with a chain of descending ledges below making it very easy to just hop down step by step one floor at a time. There is fire gear here but it has mostly been all vandalised/stolen. There is also a fire escape exactly opposite my apartment, seems good until you go down one floor only to find they have sealed it off with concrete walling right in the middle of the stairs. Just hope a fire never starts below me as when the people below me are cooking I have to open the windows or sit in my own personal indoor smog.